This is one of Napa's older wineries, founded in 1973 by Jack & Delores Cakebread, now operated by sons Bruce & Dennis Cakebread. The winery farms 584 estate acres, almost entirely in the Napa Valley. 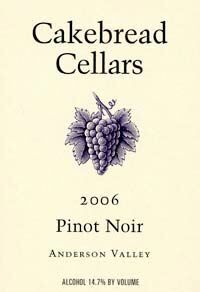 The exception being the 46-acre Apple Barn Vineyard in Anderson Valley near Boonville planted to six French Pinot Noir clones and Chardonnay in 2001, and the 60-acre Annahala Vineyard just a half-mile west of Apple Barn containing eight clones of Pinot Noir. 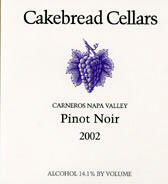 Known for Chardonnay, Sauvignon Blanc, and Cabernet Sauvignon, Cakebread also produces several Pinot Noirs: Anderson Valley, Two Creeks Anderson Valley, Apple Barn Vineyard Anderson Valley, Annahala Ranch Anderson Valley and Carneros. The winemaker since 2002 has been Julianne Laks, the third winemaker in the winery's 40-year history. She is a UC Davis graduate (1977) and had enology positions at Beringer and Beaulieu Vineyards before joining Cakebread as a part-time enologist. She soon became full time, was then promoted to assistant winemaker, and became winemaker when Bruce Cakebread became president and COO. Tours and tasting are by appointment at the popular Visitor Center in Rutherford. The wines are available online and widely distributed.